Today's edition of "Way Back Wednesday" features an aerial photo I took back in 2008. I spent about 10 minutes flying around Walt Disney World with my student, trying to get as many shots as I could. This one is of Disney's All-Star Sports Resort, which doesn't seem quite as big from this angle. It took us about a minute to fly from the area of the Magic Kingdom to the All-Star resorts. This mode of travel sure beats taking the bus! As I was waiting for the Magic Kingdom ferry boat to take me back to the TTC tonight, I noticed this pretty sunset view of the Grand Floridian. Disney's flagship resort looks great from this angle. This time of year is great for outdoor photography in Florida, as there is very little humidity in the air. 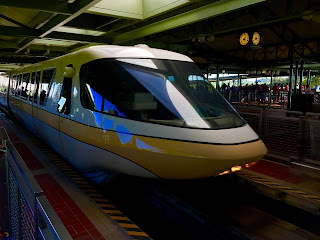 It has been a while since I've posted a monorail photo. Today, after getting a haircut at the Magic Kingdom, I found myself on a fairly quiet platform as my favorite form of transportation was arriving. Although I have many shots like this on file, I just couldn't resist snapping another one! 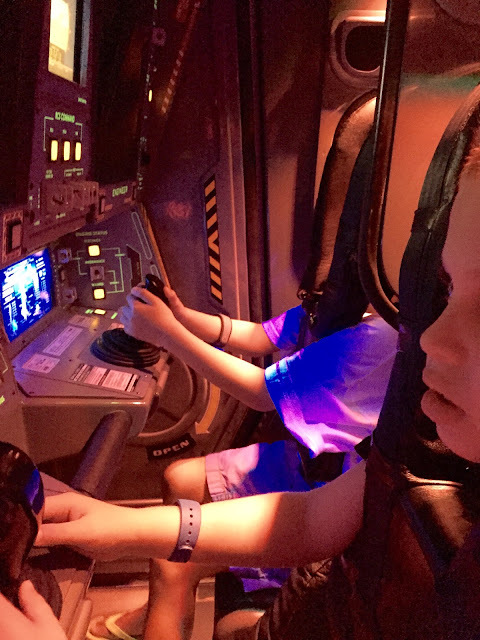 Mission Space has been thrilling Epcot guests for more than a decade. When it first opened, there was only one version, which simulated space shuttle g-forces by spinning guests at a high rate of speed. This became the first (and only) attraction with motion sickness bags available to guests. 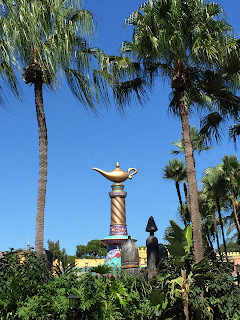 A few years after opening, Disney made the wise decision to offer a "less intense" version, which is virtually the same ride without the spinning. I took this shot last week from inside the cockpit, as my son and his friend were preparing for launch. In continuing with yesterday's idea of well themed gift shops, I found myself in the Stage 1 Company Store at Hollywood Studios today. 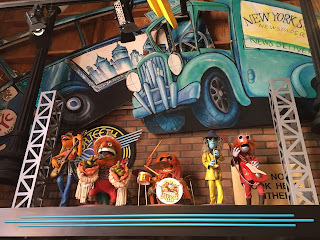 This Muppets focused store is located just outside of the exit of Muppet*Vision 3D. It is one of my favorite gift shops in all of Walt Disney World because of the amazing amount of detail that can be found here. 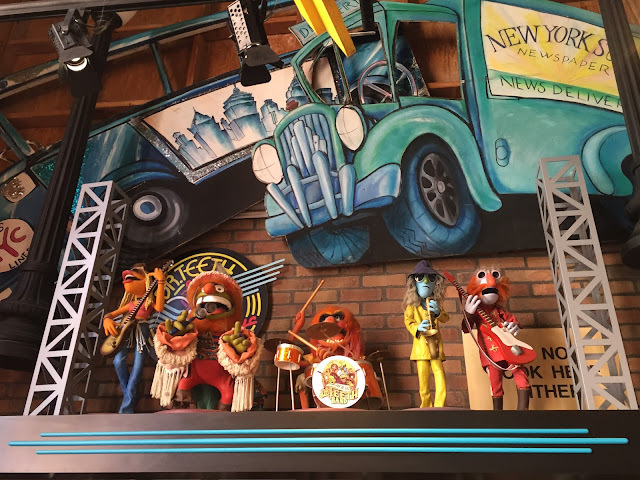 This shelf contains the whole "Dr. Teeth and The Electric Mayhem" band in doll form. I have so much fun discovering displays like this! 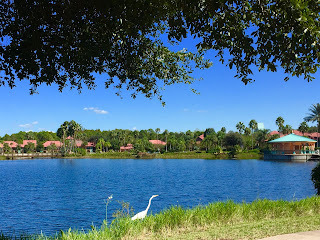 One of my favorite resorts to stroll around is Coronado Springs. There are many winding paths, and the grounds are beautiful. 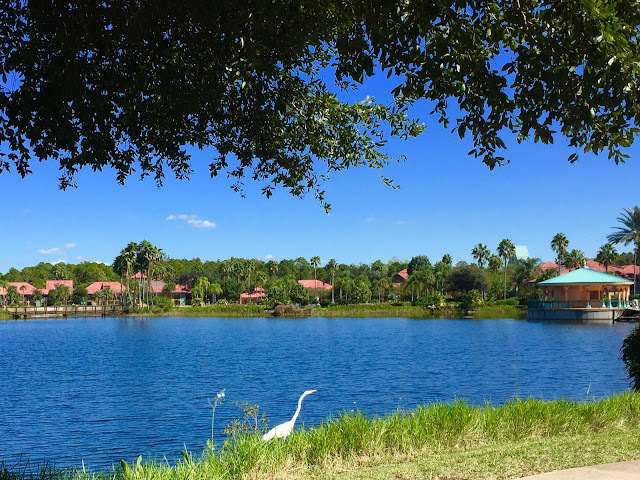 The buildings are situated around a good size lake, which gives guests so many opportunities for great photos. I took this shot today from the Casitas section of the resort. The bird posing for me was just an added bonus. 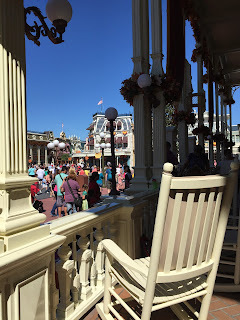 One of my favorite things to do in the Magic Kingdom is to find a comfortable spot and people watch. 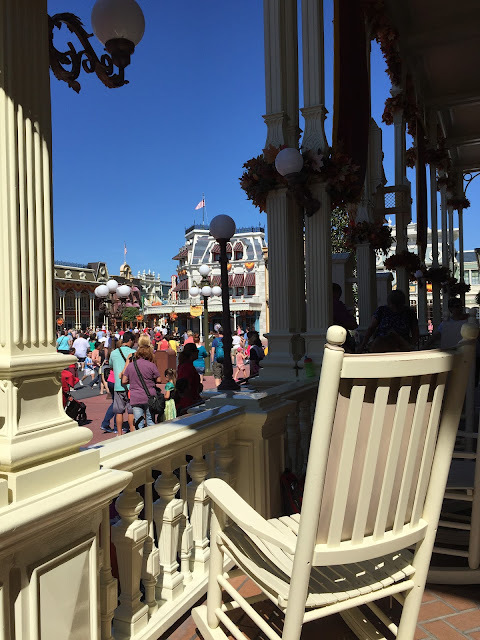 A great place to do this is from a rocking chair on the porch of the Town Square Theater. It offers a great vantage point to see the excitement of guests entering the most popular theme park in the world. I took this shot a few days ago, while enjoying the beautiful October weather that Central Florida is known for. Today, I had the chance to ride Living with the Land at Epcot for the first time this month. 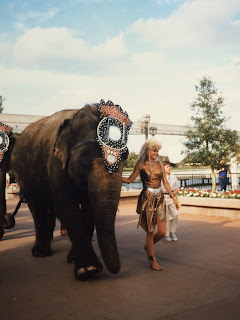 This is one of the few remaining attractions from Epcot's opening back in 1982. 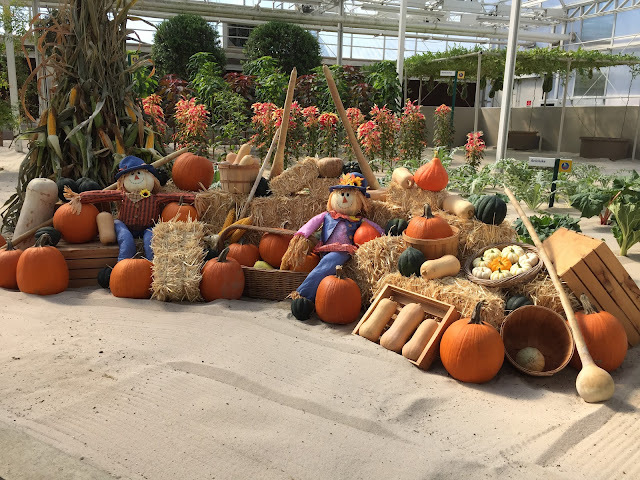 As we floated through the greenhouse area, it was fun to see this display set up for the "fall season." 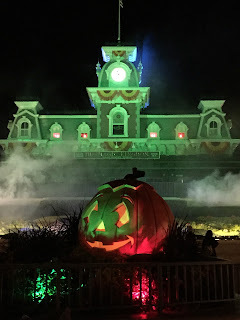 It seems that Disney is always doing little things like this to highlight the different times of year. I was standing near the exit of Jungle Cruise yesterday, when I saw this view of Adventureland. I like how the palm trees nicely framed the lamp atop The Magic Carpets of Aladdin. It is always fun for me to see a different perspective of attractions that I've been enjoying for years. 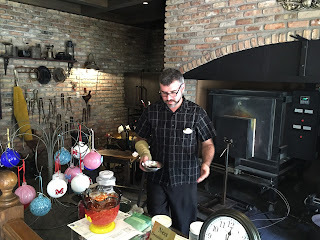 Today, I had a young tour guest who was interested in seeing a "glass blower" in action, so I took him to Crystal Arts on Main Street in the Magic Kingdom. This store features handmade crystal and glass item, many of which are made right on location. Here is a master craftsman who was in the process of creating a "glass ball" Christmas ornament. This is a great little spot that many guests don't even realize exists in the most popular theme park on earth. While waiting for my tour guests this morning at Hollywood Studios, I found myself standing near the charter bus drop off area. 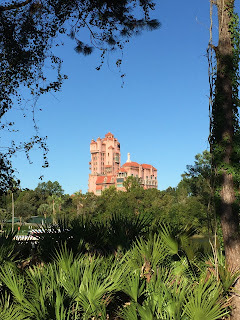 I noticed the Tower of Terror in the distance, framed by nearby trees and bushes. Although it doesn't look scary on a bright sunny morning, it is still an impressive structure, even from a distance. Here is a shot of my dad and sister from back in 1977. They are standing in front of the now extinct 20,000 Leagues Under the Sea in the Magic Kingdom. This classic attraction was located in the section where New Fantasyland is today. 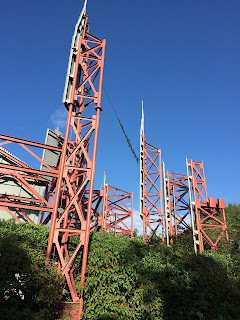 The Seven Dwarfs Mine Train currently sits where the loading area seen in this photo used to be. 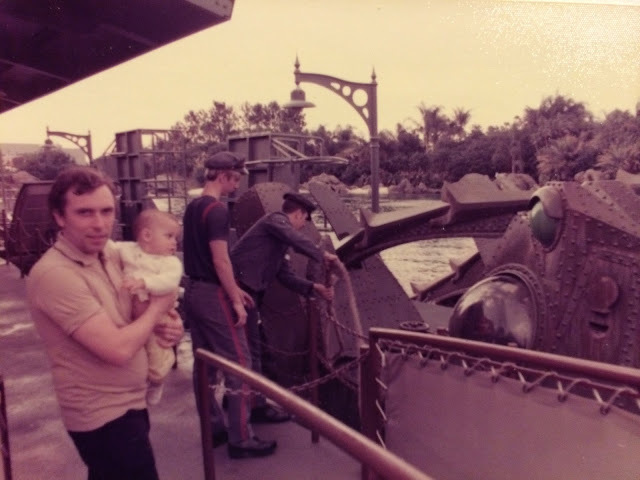 Although 20,000 Leagues has been gone from the Magic Kingdom for many years, a similar submarine attraction can still be found in Disneyland. 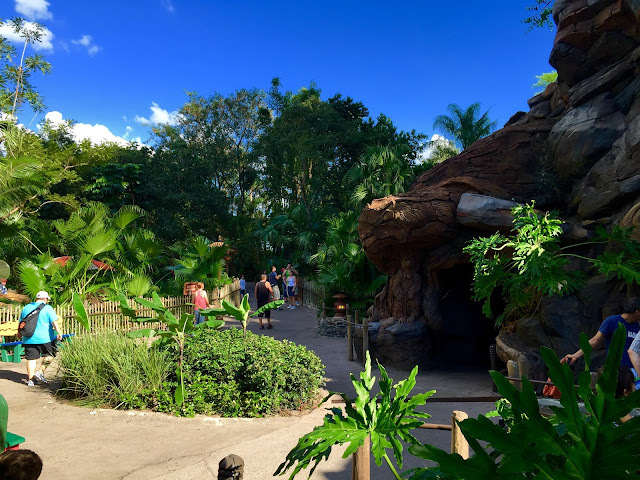 The Tree of Life at Animal Kingdom recently underwent a refurbishment, and the area surrounding the park icon was inaccessible to guests. It has now reopened and there are some notable changes, especially near the exit of It's Tough to be a Bug. You can see the Tree of Life on the right side of this picture. Disney removed much of the foliage and made this area considerably more open. They also remove the overhead netting, which helps to portray a more natural look. Continuing with this week's semi-theme of framing pictures with rock work and/or statues, I took this shot near the exit of Thunder Mountain. I have spent quite a bit of time over the years waiting for my tour guests a few feet from this spot, but this is the first time this opening caught my eye. 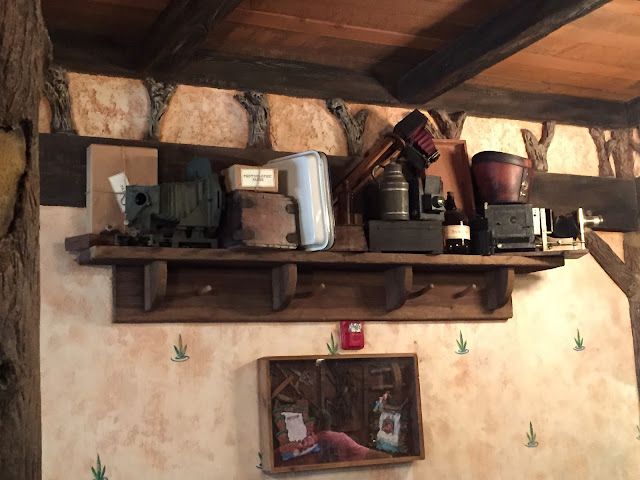 The next time you are exiting from the left track of this attraction, look over your left shoulder and you may see this "hole in the wall" that millions of guests have never seen! 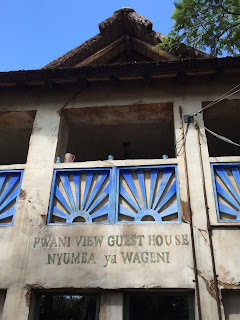 While waiting for my tour guests to finish lunch at the Tusker House today, I noticed some interesting "props" on the exterior of this Animal Kingdom eatery. The upstairs part of this structure is themed to be a hotel or "guest house." On the ledge, you can see a pitcher and a few glasses, as if there were guests sitting up there. This is just another example of Disney's attention to detail. 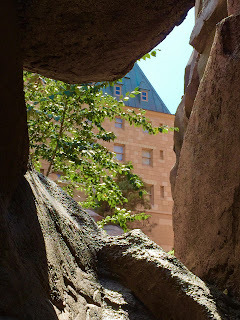 While waiting for my tour guests outside of O' Canada today, I noticed this view of the Hotel du Canada in the cutout of the rocks. The rock work and waterfall that are part of this Epcot pavilion are visually impressive. When you head toward the back of the area, you almost forget you are still in a theme park. I have literally taken hundreds of photos of Space Mountain over the years, but I am pretty sure this is my first one from this angle. 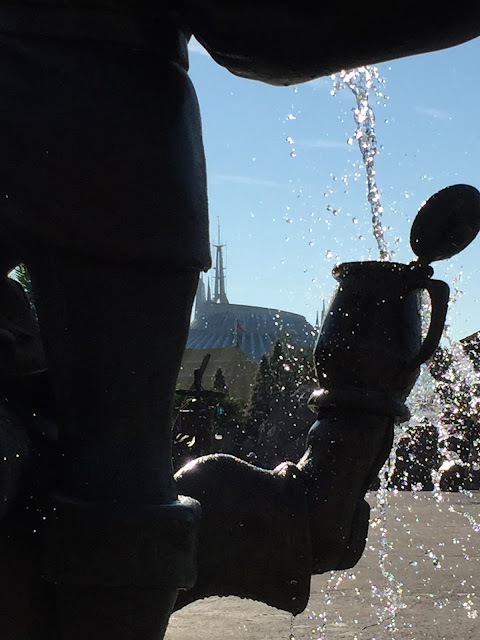 This morning, I found myself standing in front of Gaston's Tavern looking toward tomorrowland. I noticed the iconic attraction directly through this statue of Gaston and LeFou and thought it would make a fun photo. While giving a Hollywood Studios tour today, I ran into Donald's girlfriend strolling through the park. She was heading backstage from her meet-and-greet area. 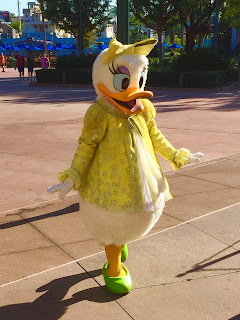 I can't prove it, but I'm pretty sure Daisy batted her eyelashes at me! 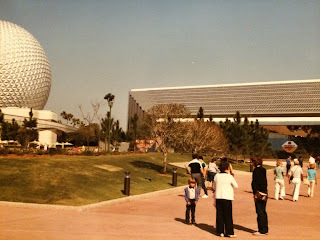 Here is a shot of Future World from back in 1984. 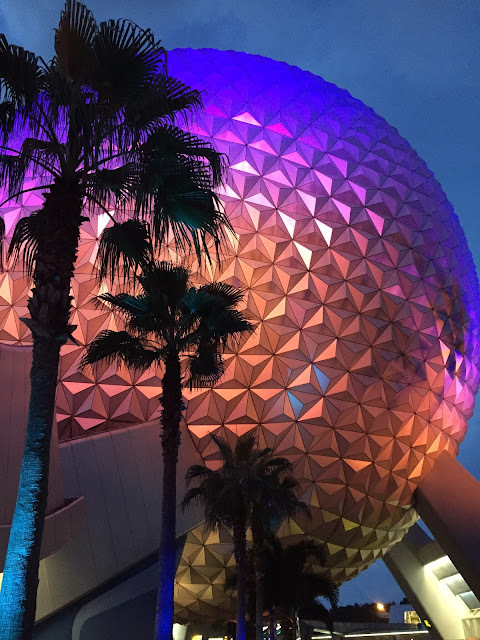 You can see both Spaceship Earth and Universe of Energy in this picture. Although both of these pavilions are still a prominent part of Epcot, it looks like the landscape was quite different back then. It appears to have been much more open with very little foliage. The two pavilions in Future World East that you can't see are World of Motion and Horizons, which have both been gone for many years. Although the Frozen Summer Fun event has come to an end at Hollywood Studios, Wandering Oaken's Trading Post has reopened in a new location. It has taken over the AFI building that used to be at the end of the Studio Backlot Tour. Although there is no longer an ice skating rink, it includes a frozen snow play area and a snack bar. There is also a large Frozen gift shop with plenty of merchandise for fans of this incredibly popular movie. Today, my tour guests ate lunch at Teppan Edo, in the Japan pavilion at Epcot. While waiting for them to finish up, I had a few minutes to snap some photos on this beautiful fall day. I took this shot while standing on the wrap around deck just outside of the restaurant. There is quite a view of World Showcase Lagoon from up there. 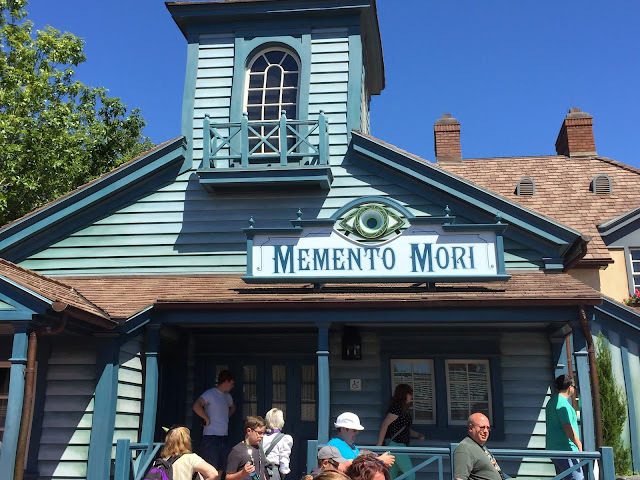 The new Haunted Mansion themed gift shop in Liberty Square is now open......sort of. This store, which took over for Yankee Trader, is soft opening tonight as part of Mickey's Not So Scary Halloween party. When I took this shot earlier today, it was still closed. 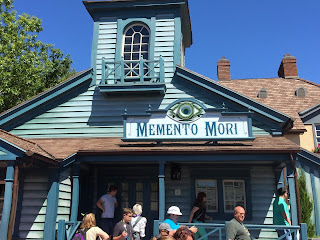 I confirmed with a cast member outside this location that the name Memento Mori translates to "remember the dead." Unfortunately, the Maelstrom attraction in Norway at Epcot is closing permanently this weekend. The popularity of Frozen has grown to epic proportions and Disney has decided to replace this classic attraction with something from the most popular animated movie of all time. You certainly can't blame them for making the change, but Maelsteom will definitely be missed. 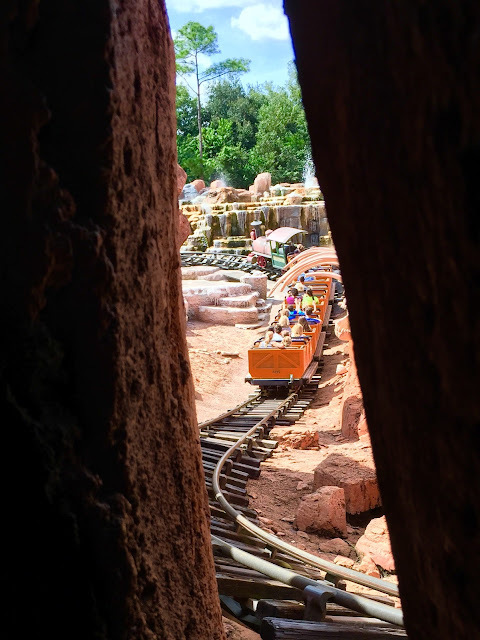 We had the chance to ride it one final time last night, and I took this panorama of the giant mural in the load area. We were at Epcot tonight to watch Starship perform in the "Eat to the Beat" concert series. We also had the chance to ride Maelstrom one last time before it closes permanently on Sunday. As we were walking toward the Fountain of Nations, my wife looked over her shoulder at Spaceship Earth and thought it looked like a nice picture. I totally agreed with her. I often talk about the amazing details you find around Walt Disney World, and today's picture is no exception. If you look at the Barnstormer on its own, it is little more than a kiddie coaster that you may find at a local amusement park. However, when you add in the Great Goofini story, it becomes a well themed Disney "attraction." 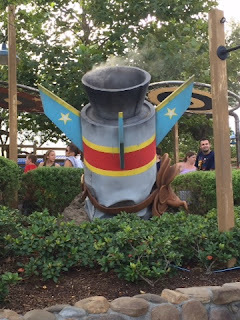 This crashed rocket with the trailing smoke is just one example of the fact that Goofy needs significantly more practice on his circus routines! Today we say happy 43rd birthday to Walt Disney World. 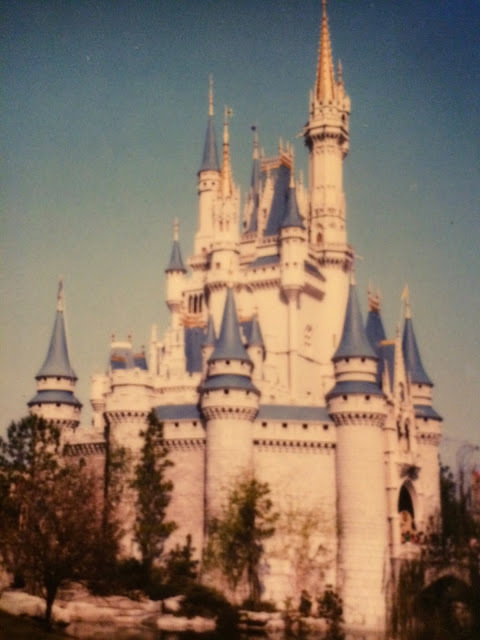 The Magic Kingdom opened on October 1st, 1971. The main icon of this park has always been Cinderella Castle, and I thought the best way to celebrate would be with a picture of this world famous structure. 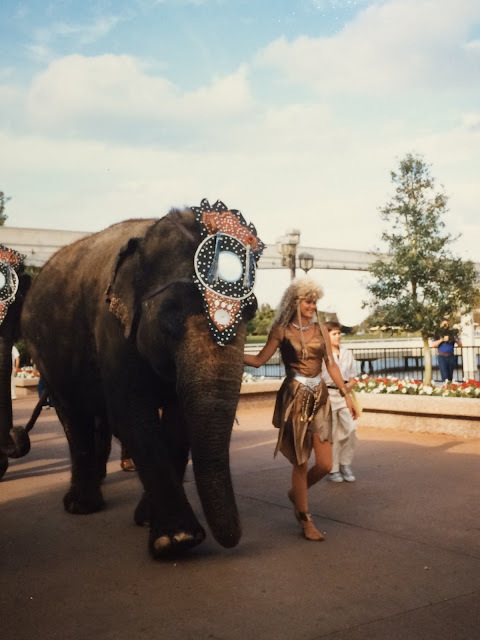 This photo was taken on our family trip back in 1984. It was after this visit, at the ripe old age of 12, that I decided I wanted to work at Walt Disney World someday. That someday took almost 30 years, but patience and passion have finally paid off! 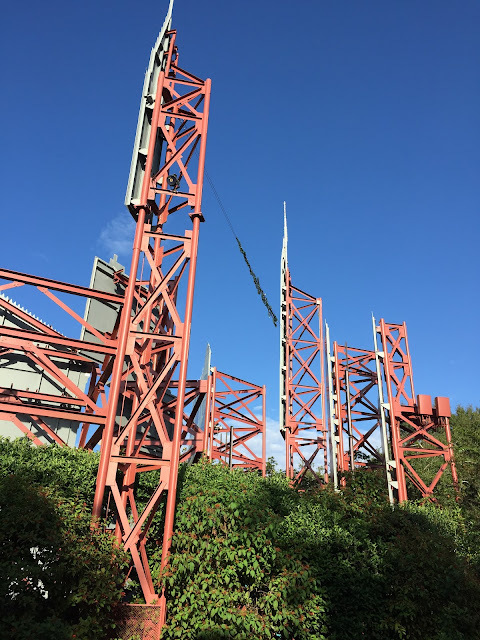 The Astro Orbiter in Tomorrowland is flying again after a lengthy refurbishment. 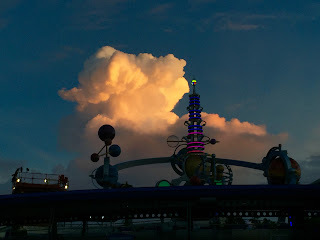 I was enjoying the Magic Kingdom with our son tonight when I decided to take some shots of the iconic attraction that visually draws visitors toward this part of the park. The sun did a great job of illuminating the cloud in the background, while turning Rocket Tower Plaza into a silhouette.